grandson,mother,five siblings with their children and grandchildren. Thanksgiving dinner with my family usually means having 30-35 family members taking up every conceivable seating space in the house. Everyone contributes to this meal and there’s always enough leftovers to take home. It’s a heart-filling sight to experience and I revel in this pleasure. Riding on this high and wanting to share the abundance of this dinner with my friends, I started a tradition years ago. I asked folks to bring over leftovers from their Thanksgiving dinner to share with each other. Over the years it morphed into a Day After Thanksgiving hike and supper. Every year we start with a leisurely walk to work off all the yummy food eaten the night before. Since we’re blessed with an abundance of forests, wetlands and seashore to choose from, it’s a different place each year. There’s lots of time to talk, laugh,bird watch and take in nature. Cheese, bread, sandwiches or whatever anyone wants to bring is shared on the trail. 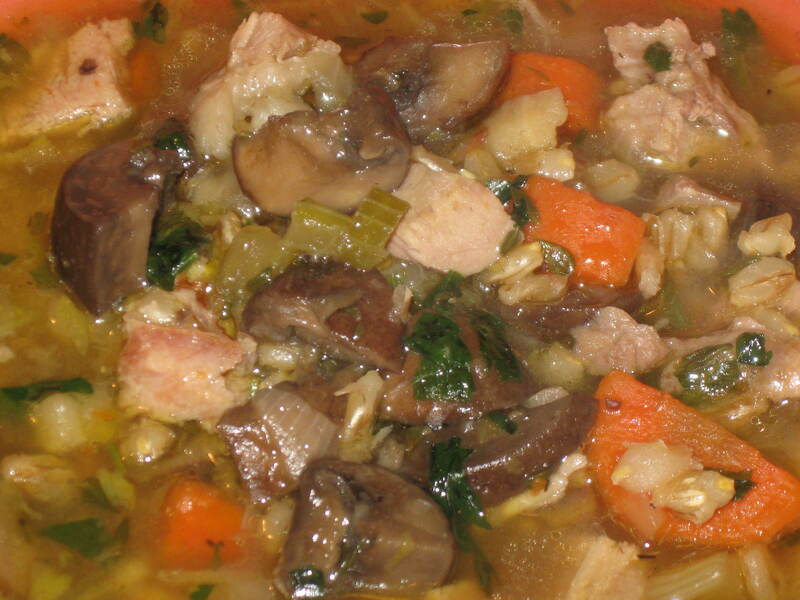 Afterwards we gather at my home for a supper consisting of whatever folks have brought and a turkey mushroom barley soup I’ve made from the leftover turkey carcass,stock, meat scraps and veggies. Someone starts up a fire while others set out the food that’s shown up. When the rich earthy aroma of the soup floods the kitchen I call out,”Soups on”. We gather together and someone makes a toast to the soup and our shared gratitude for the abundance in our lives. Life is good. parsnip. 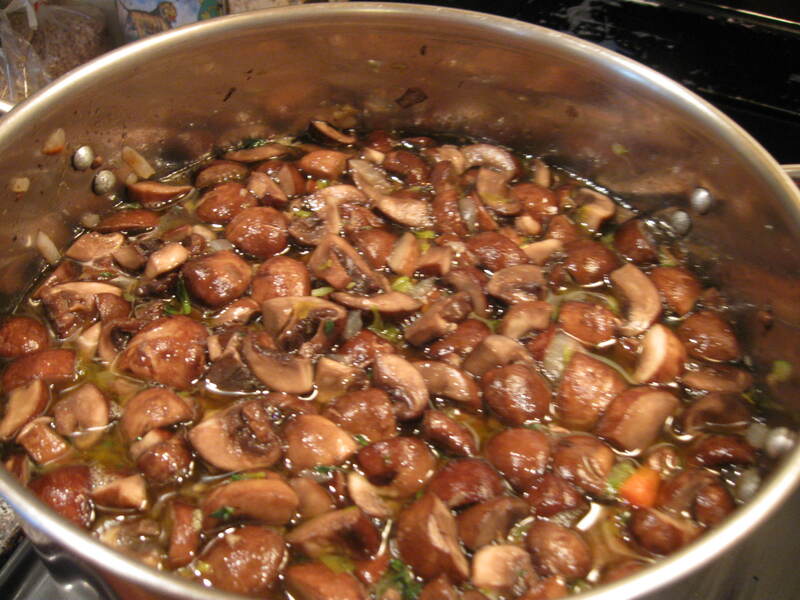 Wash and break stems off mushrooms and add to pot. Save the caps for later. 3. Cover pot and bring to a boil. Simmer for 30 minutes. 4. 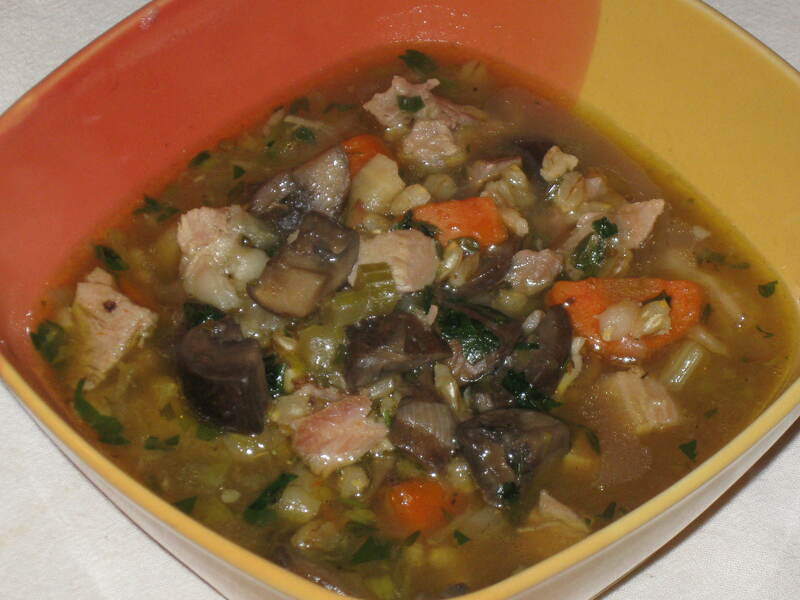 Strain turkey and vegetables and discard. Save the broth for soup. celery stalks and parsnip. Saute vegetables in butter until soft. Add thyme and black pepper. 6. Add the turkey broth and bring to boil. Simmer for 25 minutes. 8. Add sherry to taste and simmer for 5 minutes.